Galaxy S4 Faces its Toughest Rivals: Xperia Z, HTC One and iPhone 5, Samsung has presented Thursday in New York the fourth generation of his Galaxy family S4. 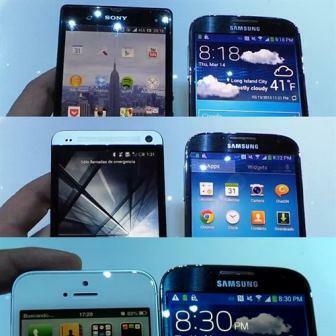 The new ‘Smartphone Galaxy S4‘ has a number of features that make it one of the strongest bets for this 2013. However, the Galaxy S4 must face some tough opponents that are not far behind in terms of hardware and software. Z is the Sony Xperia, HTC One of Taiwan’s HTC and Apple iPhone 5. The Samsung Galaxy S4 has a very elaborate design, thinner than its predecessor, with just 7.9 millimeters thick, weighing 130 grams and 2,600 mAh battery. A Super AMOLED HD screen five inches and four or eight processor cores, according to markets, to 1.9 GHz and 1.6 GHz, respectively. Also includes 2GB of RAM, Android 4.2.2 Jelly Bean, internal memory of 16, 32 or 64 GB, expandable via micro-SD card, 13-megapixel rear camera and 2 megapixel front Full HD. It also supports HSPA +42 Mbps and 4G LTE. As software all a wide range of novelties designed for the users can control their device without touching. Smart Pause Among them, a new South Korean technology that recognizes the user’s face and adjusts play to their attention. It also incorporates Smart Scroll, which allows users to post and browse your web browser by simply his gaze and Air View and Air Gesture, a system that allows the terminal to recognize the gestures and movements of users without having to touch it. If we put the new S4 Galaxy Xperia front of Z, the issue becomes the less interesting. Both Asian manufacturers have opted for a minimum thickness of 7.9 mm while the new ‘smartphone’ Samsung is even lighter with only 130 grams, compared to 146 of the Xperia. Both companies have opted for the five inches. In the case of Sony, with a tempered glass front and back and both shockproof and anti-scratch side, with a pixel density of 443 dots per inch, Samsung meanwhile has the third-generation glass Corning Gorilla Glass and a pixel density slightly minor, 441 ppi. As for his heart beats Samsung Sony since presented two processor models: first, a quad-core 1.9 GHz and an eight-core 1.6 GHz The ‘smartphone’ Sony account with a quad core processor Snapdragon S4. Coincide in RAM, 2 GB, and the Galaxy S4 surpasses him in storage, there will be versions 16, 32 and 64 GB, up to 16 GB of Xperia Z, and version of Android, 4.2.2 the S4 versus 4.1 Xperia Z. Another rival Galaxy S4 is the new flagship of the Taiwanese HTC, the HTC One In this case, the S4 exceeds One display (five-inch Samsung S4 4.7 compared to the One); processor ( four cores at 1.7 GHz One against all four cores at 1.9 GHz S4) battery (2,600 mAh of S4 and 2,300 of One) and Android version (4.2.2 and 4.1.2 on the S4 One ). The HTC One is somewhat heavier than the S4 (143 grams) and thicker (9.3 mm) and less battery capacity (2,300 mAh compared to 2600 mAh of S4). As a camera, the difference is minimal because the One has a 4 MP rear camera with Ultra-Pixeles and 13 megapixel camera for S4. Both terminals agree RAM, 2 GB, and capacity models (32GB and 64GB). As for software, the One racing version 5 and HTC Sense BlinkFeed that allows reading news feeds Flip-board style from a widget on the desktop. Finally, the S4 Galaxy faces his great rival, both in the marketplace and in the courts, Apple and its iPhone 5. Comparing the two new handsets, the Apple devices lags behind in some respects starting with your screen. Although Apple has decided to extend the display of their last respect to its previous iPhone models (4 inch) remains at one inch from the new S4 (5 inches). The iPhone 5 has a dual core A6 processor at 1.2 GHz that overshadows the four and eight cores of the new S4. As a camera, the back of the iPhone 5 remains in the 8 megapixels versus 13 megapixels of S4. As for the iPhone 5 incorporates software version 6 with Passbook iOS, the Maps application itself Apple and Siri improvements. It is also worth noting that it seems that the company prepares its next iPhone model this year, so we will wait to see if your specifications and exceeds the fourth generation of the Galaxy family.